Karditsa town. Karditsa is a town located in the district of Thessaly on the mainland of Central Greece. It is the capital of the department. This town lies on the edge of a tributary of the Pinios river and it is the commercial, administrative, economic and cultural center of the region. Karditsa is situated approximately 300 kilometers (186 miles) from Athens and can be reached by car, bus or train from Athens and Thessaloniki. 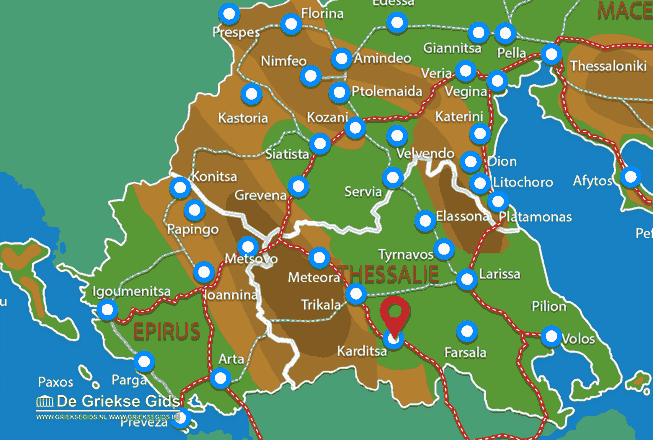 Karditsa has been inhabited since 9000 BC. The city has good urban planning and there are bike lanes and pedestrian streets. Karditsa is one of the most bicycle-friendly cities in Greece with a widespread network of bicycle paths. In Karditsa is the beautiful Pafsilipos Park and on the edge of the park is the historic Cathedral of the Holy Emperors Constantinos and Eleni. Today, just over 40.000 inhabitants live in Karditsa. Karditsa: Where on the map is Karditsa town located?